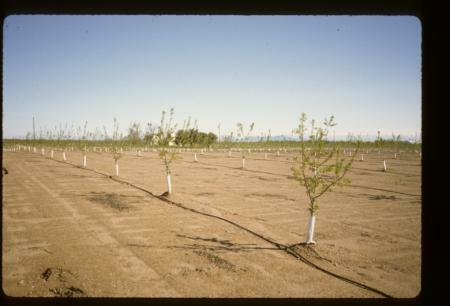 Single-line drip system used in a young orchard. Photo: L. Schwankl. In a perfect microirrigation system, every emission device (drip emitter or microsprinkler) would be discharging water at exactly the same rate. This never occurs in the real world, so you should expect to see variability in the discharge rate from one emission device to the next. Some emitter or microsprinkler discharge variability may follow patterns that can be easily explained. For example, (1) elevation changes may explain increases or decreases in discharge rates, (2) emitters or microsprinklers farther from the head of the system are often at a lower pressure due to friction losses, and (3) emitters or microsprinklers farther along a lateral line may be at a lower pressure than those at the head of the lateral line, again due to frictional pressure losses. A significant decrease in emitter or microsprinkler discharge rates at the tail end of lateral lines may indicate a clogging problem caused by a lack of system flushing. Silt and clay particles often settle at the tail end of lateral lines and unless they are flushed out of the system, they can clog emitters and microsprinklers. Manufacturing variability. There are always slight variations in discharge rate between one emission device and the next due to manufacturing differences. For quality equipment, this variability will be small and is difficult even to measure in a field installation. Biological, particulate, and chemical precipitates. Biological, particulate, and chemical precipitate clogging can all occur in a random pattern. One emitter or microsprinkler may show a reduced discharge rate due to clogging while an adjacent emission device will show no such evidence. Discharge uniformity measures the variability of emitter or microsprinkler discharge rates. There are a number of terms used to quantify discharge variability but commonly used is distribution uniformity (DU). Design emission uniformity (EU) is sometimes used to quantify microirrigation uniformity. The numerical values for EU and DU for a given system are the same. The average of the low-quarter discharge rates is determined by ranking all of the measured discharge rates, from lowest to highest and averaging the low 25% of discharge rates. For example, if 40 emitters or microsprinklers were measured, you would rank them lowest to highest, and then average the discharges of the 10 emission devices with the lowest discharge rates. That would be the average of the low quarter discharge rate. Emission uniformity (EU) is often used to quantify the uniformity of the design of a new microirrigation system. The following table lists recommended EU ranges for various microirrigation systems. Remember, the numeric values for EU and DU are the same. Source: ASABE EP405 Standard. February, 2003. Due to wear on emitters, clogging, and leaks, the DU value for a microirrigation system often decreases over time. Good maintenance will help minimize the rate of decline. If you have previous evaluations to which you can compare your new data, a DU decline of 5% or more since the previous evaluation is an indicator that a problem such as clogging is occurring. A corresponding decline in average application rate would be further evidence of clogging. If this is the first evaluation of the microirrigation system and the DU value is substantially below the recommended ranges in the table above, determination of the cause of the variability should be a two-step process. Examine the pressure measurements you have gathered during the evaluation. Significant variations in pressures within the system will lead to variations in emission discharge rates unless you are using pressure-compensating (PC) emission devices. When determining how to mitigate excessive pressure variability, make sure to consult with an irrigation professional, most properly a qualified microirrigation system designer. If pressure measurements show relatively consistent operating pressure within the system, the variability in emitter discharge is likely due to clogging of emitters. For information on solving this type of problem, go to I have a clogging problem and I want to solve it. For an Emission Uniformity example, click below.